As I mentioned in my "I'm back" post, I now live in a very remote area. What is more, I also live in a small town (less than 10,000 people). There are very few local markets and I can charitably say that local tastes match local political views; they are very conservative. That means that the restaurants around me focus mostly on burgers, bad steak, pizza, pasta with heavy sauces, Americanized Mexican, and sandwiches. The most exotic place is a Thai restaurant and there is one American Chinese place which offers very pedestrian options. I'm not mentioning this to criticize the local food scene because I know that one's taste in food is one of those things that is shaped by experience. People like what they like because it is what they grew up with and it's not like the people who live in rural areas made a conscious decision to have limited food options. If anything, we can blame their parents and grandparents. I certainly can say my parents have terrible taste in food and any restaurant scene that their patronage cultivated would be populated by places with leathery, over-cooked meat, canned vegetables, noodles, and potatoes. It would be even more grim than the reality I currently live in. The reason that I mention the limits here is that any Japanese food I find at local markets outside of Pocky and some more common cooking ingredients (soy sauce, rice vinegar, etc.) are a suprise find. When I locate one of these finds, I'm stunned because I can't imagine the locals buying them. That leads me to today's shocking find of frosted ginger sembei. I found these at Grocery Outlet Bargain Market. I've been told it's the west coast equivalent of Aldi's, but I can't verify that as I've never been in an Aldi's. The thing they are supposed to have in common is food at low prices because it was over-produced, unpopular, or is getting on in years. I'm guessing this sembei showed up because it was unpopular, but it's hard to know for sure. The first shocker was that it was in a local market at all. The second was that it was being sold for 50 cents a bag. In the Bay Area, I had to pay $4-$6 per bag for this same brand of sembei. In Japan, this would cost the equivalent of $1.50-$2.00 for a bag. It was insanely cheap by any estimate. I bought 25 bags. I am not exaggerating. My pantry has stacks and stacks of these. The difficulty in marketing these to the American market is explained somewhat by the description panel on the lower right panel of the bag. In particular, the fact that the manufacturer feels it is necessary to say, "no topping needed" is revealing. 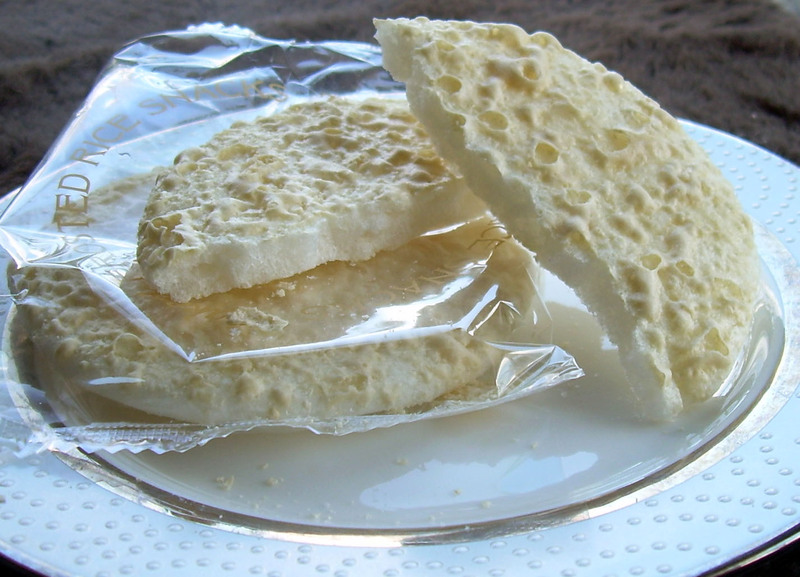 Americans see rice crackers as a savory item that needs a topping like a Quaker rice cake. Buyers have no idea what these are until after they've purchased them. In fact, when I bought them, the cashier looked perplexed at what they were. I'm guessing just me, and possibly the Japanese members of the taiko club a great many miles South of me, are the only customers and potential customers who know what these are. 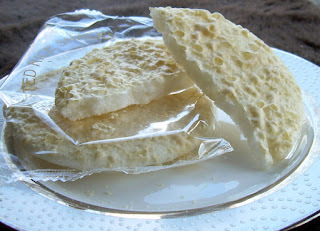 What these are is a very, very tasty snack with a surface that makes you think of the moon with luscious sugary craters. They'd better be great if I'm going to drown myself in stacks of crispiness. 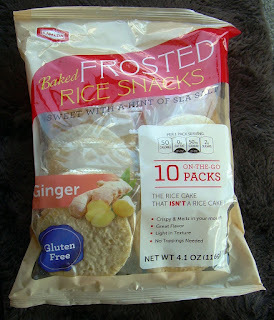 They are light and somewhat sweet with enough ginger to whisper kindly at your tongue, but not to overwhelm. They snap without being too brittle and actually do melt in your mouth if you leave them in there long enough. It's easy to eat far too many at one sitting, but given that each large cracker is only 25 calories, it's hard to get fat on them. I've actually be fairly responsible with these and limit myself to one packet (two crackers) per day. I will likely have my stash for months at that rate, but they come with an enormous oxygen absorber packet so I'm betting they won't go stale. If they start to, I'll just have to watch a good movie and start consuming them by the bag-full so as not to waste my luxurious investment of $12.50. I should note that I had confidence in these and how good they'd be because the company that mades them, Kameda, is one that I recognized from my time in Japan. In fact, I have reviewed no small number of their sembei in the past including one sweet variety made of chocolate. They rarely let me down and I was pleasantly surprised to see something from that company at a local market. While this clearly is packaged for the American market (since everything is in English), the rice crackers (sembei) themselves are precisely the same as what you'd get if you shopped in Tokyo. And, yes, I'd absolutely buy them again, even at a higher price. Finds like that are so fun! These sound delicious. They are amazing! If you stumble on them, stock up! I just found your blog. Your writing is great. And yes, these snacks look fun. Have a nice weekend!